Linda: Thanks for joining me today. I’m a huge fan of your Drew Farthering novels and was delighted to discover that you’ve written other series as well. Before we get into that, I’d like to chat about your latest “Drew” book that was published in November 2017, Death at Thorburn Hall. It sounds intriguing. Where did you get the inspiration for the plot? DeAnna: Thanks so much for letting me visit! Before we go on, I want to make sure your readers know I write under my real name, DeAnna Julie Dodson, and under my pen name, Julianna Deering. If they’re looking for Drew Farthering Mysteries, they’ll have to look under Deering, not Dodson. 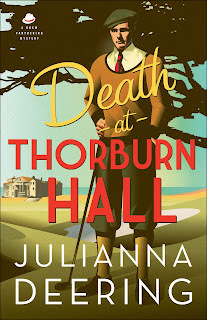 Anyway, to answer your question, I got the basic idea for Death at Thorburn Hall because I wanted to set the book in 1935. Drew and Madeline have had a lot of cases to solve since they met in 1932, so I didn’t want to set this one too close to the last one. With 1935 in mind, I had a look at some major events in Great Briton during that year. When I saw the British Open was played at Muirfield in Scotland in ’35, it gave me a place to start. I’ve never played golf, but my dad used to play at least once a week, and he still watches the tournaments on television. He’s taught me enough about the game for me the watch it intelligently, and having already established that Drew is an avid golfer, I thought the Open would be the perfect setting for his next mystery. LM: Two of your books are part of “Annie’s Mysteries,” a series of books written by different authors. How did that come about and what was that experience like? DeAnna: Actually, I have eight books out from Annie’s Fiction, four from “Annie’s Attic Mysteries” (Letters in the Attic, The Key in the Attic, The Diary in the Attic and The Legacy in the Attic), one from “Annie’s Secrets of the Quilt” (Decadent Deceit), one from the “Antique Shop Mysteries” (A Ring of Deception) and two from the “Secrets of the Castleton Manor Library” (An Autographed Mystery and Pride and Publishing). Each of these is part of a multi-book series written by a variety of authors. 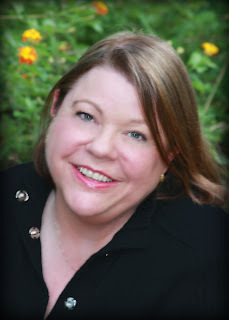 I was connected with Annie’s by my agent who was, at the time, working on finding a home for my Drew Farthering Mysteries. She thought Annie’s would be a great fit for me, since I enjoy writing mystery so much, and it has been. Everyone there is SO nice to work with. It’s interesting working on a series with many other authors, because you have to be very careful to keep the continuity right from book to book. If the heroine has blue eyes in Boon One, she’d better not have brown eyes in Book Four! And I just signed on for three (or more) books in a new series: “The Inn at Magnolia Harbor.” For a nice change of pace, these books are romance/women’s fiction and not mystery, though I might work in a bit of mystery here and there where appropriate. LM: You have published lots of books. What is your favorite part of the writing process? Honestly, writing is a very laborious process for me. I’m a very slow writer, too, and I have to force myself to stay on schedule if I’m ever to get anything done. I never fail (about three-quarters of the way along) to wonder if it’s even possible to make the book work and wonder why I didn’t just go into ditch-digging before getting involved with this infernal writing career. But when I get to the end, when the story comes together and starts to work, when God somehow takes the mess I’ve made and makes something coherent out of it, I know I have done the thing for which I was created. There is absolutely nothing more satisfying than that. LM: Your novels have featured eras from contemporary to medieval, Civil War, and the 1930s. What do you do differently to write a historical rather than a contemporary novel? DeAnna: There is much more research involved for historical works. Yes, in a contemporary, I definitely have to research the area where the book is set and do some research on how particular characters might talk and act given that setting, but most things are going to be pretty much like how I live every day (television, computer, cars, etc.). For historicals, a writer has to bear in mind the technology of the time, popular culture, current scientific discoveries, clothing, food, current events, manner of speaking and on and on and on. For me, that aspect of the process is fascinating. I always prefer historicals over contemporaries, but even in the contemporaries, I try to add a bit of the historical. For example, in The Diary in the Attic, they mystery was centered around the fate of a young man who left to fight in World War II and never returned. Yes, it’s set in modern times, but I got to write a few flashbacks to the early 1940s, and that was very interesting for me. LM: What do you do to prepare yourself for writing? For example do you listen to music or set up in a specific place? DeAnna: I almost always write at my desk in my home office. If I’m under deadline and have to be somewhere else (waiting at the doctor’s office, for example), I might bring out my little notebook and scribble a few lines. I’m not one to go out in public on purpose to write. Many writers like background noise, but I’m not one of them. As far as music is concerned, I don’t usually play anything. If I do, it has to be music only and no words, like a movie soundtrack. If there are words, I start hearing them and not the words that are supposed to be coming out of my own head. I’m pretty much a “sit down and write” kind of writer. I have been known to motivate myself to read my daily word count with M&Ms or Milk Duds. LM: You live in North Texas, a beautiful area of the country, and a place that many people visit on vacation. If money were no object, what is your idea of the ultimate vacation? DeAnna: Ultimate? I’d definitely go back to England. I’ve been a few times, but that was several years ago. Now that Drew “lives” in Hampshire near Winchester, I’d love to go back there and see it again. My second choice would be a trip to Canada to see my Dallas Stars play the teams up there. LM: What is the quirkiest thing you’ve ever done? DeAnna: Quirky? Hmmm, well, I always wear green socks on the days the Dallas Stars play. I don’t have any scientific proof that this helps the win percentage, but I do it anyway. Yes, I’m that much of a fan. Favorite Color: Usually blue, but as a Dallas Stars fan, it has to be Victory Green! Favorite Food: Oooh, that’s tough. I’d probably have to pick chocolate if there could be only one. Favorite Singer or Musical Group: That’s a tough one too, because I like a lot of different kinds of music. If I had to stick to just one, I think I’d have to go back to Bryan Duncan. If you don’t know who he is, check him out. Whether it’s high energy or smooth and soulful, he’s got an amazing voice and an infectious faith. DeAnna: I just started on the first book in the “Magnolia Harbor” series, Where Hope Blooms. I’ve also started sketching out a Regency romance that I might publish independently. (We’ll see about that one!) I just turned in my second book for Guideposts, Water Flows Uphill, and will be plotting out a third for them shortly. And, of course, I’m toying with the idea of writing four more Drew Farthering adventures. I’d love to get him into World War II. I have some delicious predicaments to put him in. But that, of course, depends on how successful the first six books are. Love a British mystery, these sound intriguing, will check them out.